Summer is finally here! I love spending this season outside with my girls. 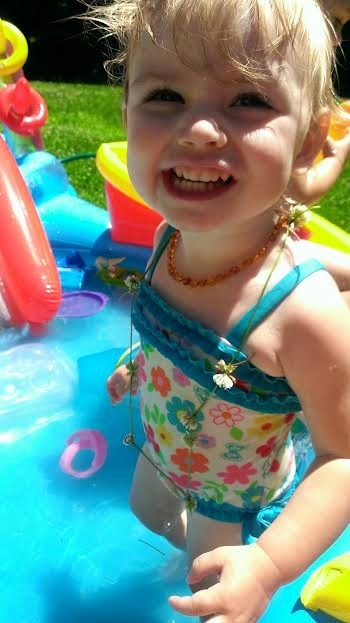 This past weekend we got a pool (just the small blowup kind) so we have been playing in that a lot. A couple weeks ago we went to a war reenactment. They had a small tent set up with children’s toys from the early 1800’s. That was really interesting and fun! 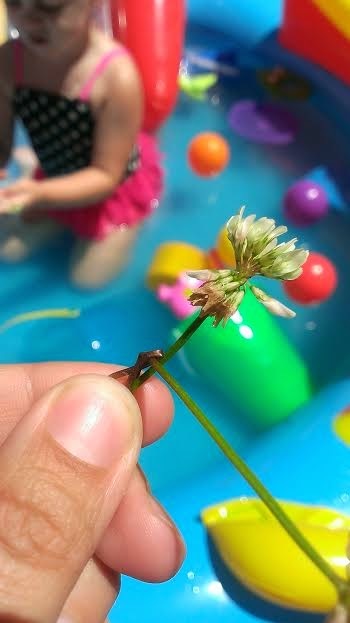 The women who was running the tent taught me how to make clover flower necklaces, which has quickly become something my girls love to do. We have lots growing in our yard and so I decided to make some today. 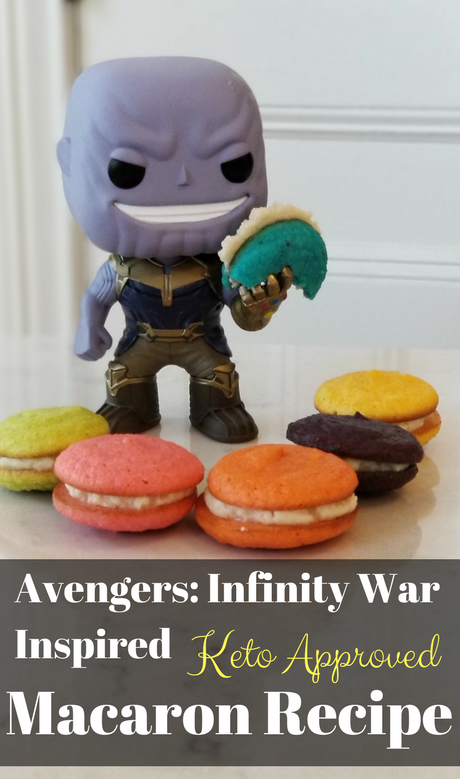 They are really easy to do and your kids will love them! 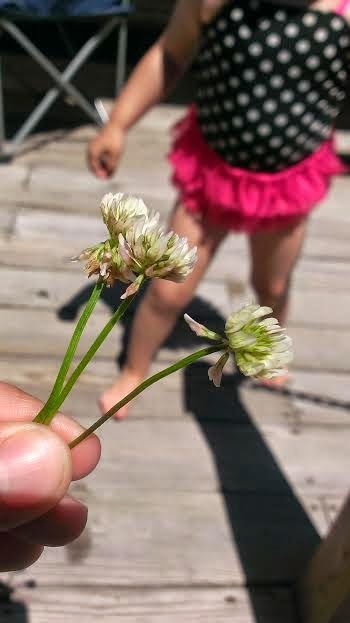 First, pick 7-10 clovers. The amount that you pick depends on how long you want the necklace to be. It also depends on how long the clover stems are. If you want to make a bracelet, just pick a few less. Then you tie the stems together. 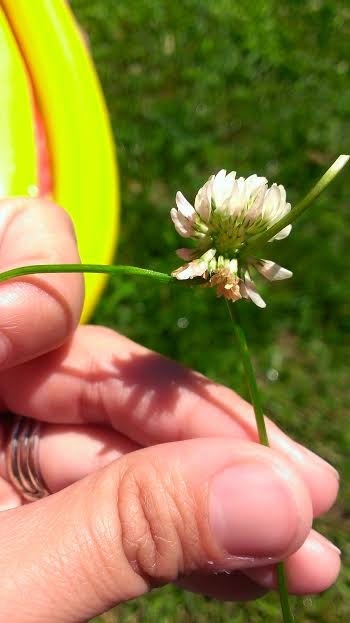 Push one knot up to the “head” of the clover. Continue to do this and then tie the last ones together – making a circle and there ya go! I hope the pictures help explain a little better! This is something that my daughters and I do every summer. I wrote this post four years ago and we still make them every summer. They are so much fun to do. It has kind of become a summer tradition for us. Something that I hope my daughters continue to do with their kids when they have them. After we are done with our necklaces, we don’t let the clovers go to waste. We feed them to our adorable pet bunny Riley, named after Inside Out. Do you have an easy DIY craft for kids? Leave it in the comments section! Chalk Markers for Family Fun!